Something that puts a burr under my saddle is when people who have limited knowledge of what the Bible actually teaches will try to use it against Christians. Early on, I had a picture of Jesus that appeared on each post on a certain weblog. 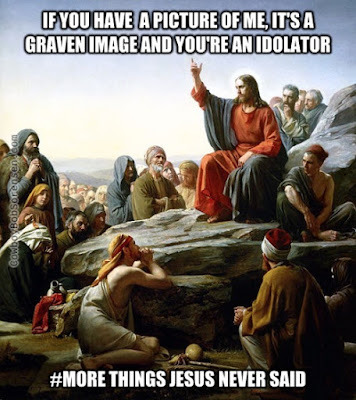 Someone was on the prod because I said something against one of his pet heterodox doctrines, so he threw down on me in the comments and added that because I had that picture, it was a graven image and I was an idolator. That'll be the day! We expect that kind of nonsense from atheopaths, but it's distressing when it comes from professing Christians who are ignorant of the Bible that they claim to believe. These are the same jaspers who falsely claim that Jeremiah 10:1-5 (written hundreds of years before Christ) means we cannot have Christmas trees in our homes. (Hint: try reading Scripture for understanding, pilgrim.) If images of Jesus are idols, it would mean that many art masterpieces throughout the centuries are wicked. Yes, we know that nobody knew what Jesus really looked like, but there's actually nothing wrong with graphic representations of him. When I was a child, I thought the second commandment meant that you should not make any image of God whatsoever. Being about seven years old, I was unaware of the work of William Blake, Michelangelo, and others, and was unwilling to draw a picture of God in Sunday School. Simply stated, a graven image is a substitute god that people worship. I'll go you one further. It is not wrong to have an image of Jesus, and I reckon it's all right to use it as a focal point during prayer. This can be a mite tricky, though, if you tend to be praying to the image and not God the Son. Keep your perspective. And no, praying to statues and pictures of saints, or praying to them in other ways, is prohibited by Scripture. Mary was a blessed woman, and many of the others who are called saints were probably fine folks, but they cannot hear you, and would object to being given prayers. For more about pictures and such, I suggest reading "What Is a Graven Image?"